Jeromy Jessop kneels in front of what is left of William Eimbeck’s observation station on Ibapah Peak. Some of the equipment remains on the top of the mountain. 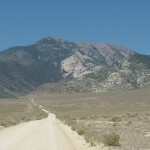 Editor’s note: Today’s Outdoor Adventure is the continuation of Sept 28’s column, which entails hiking to the summit of Ibapah Peak in the Deep Creek Mountains above the Pony Express Trail in Tooele County’s West Desert. Just before you climb the last rise to the high, open basin between Red Mountain to the south and Ibapah Peak to the north, you will pass through an area that I find incredible given the desert location. The trail follows along a clear, tiny stream that runs over moss-covered rocks and is hemmed on both sides with lush green, tufted clumps of grass. The stream is within a tall, sub-alpine fir/Engelmann spruce forest where large old logs — the shells of great trees that fell long ago — litter the forest floor. The high woods in the Deep Creek Mountains gave us the feeling we were in the Western High Uintas — a strange feeling indeed given the multiple climate zones we passed through to get to this point. After admiring the creek, we climbed up to the open basin that is approximately 4 miles from the end of vehicle traffic and at an elevation of about 10,200 feet. Its open, wind-swept character provides outstanding, sweeping views of the aforementioned high peaks. If you continue straight, you will top out on the crest of a mountain where you can look down into a deep, nameless canyon and hundreds of miles of basin and range landscape west into Nevada. We sat on an outcrop of rocks in the center of this open area and observed the beauty of Red Mountain where a matchstick, subalpine fir forest ends abruptly at a steep, red talus tree line. Looking to the west, strange granite spires and blocks rise above limber pine, and in some areas, bristlecone pine. This high, open flat is a wondrous place because you can look down Granite Creek Canyon with a birdseye view over dense, Rocky Mountain-type forests, across lower peak tops, and out into the utter desolation of the West Desert. To the north you will see two peaks. 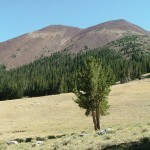 The forested peak on the left is peak 11,385 and the stack of granite that rises well above the treeline on the right is Ibapah Peak. 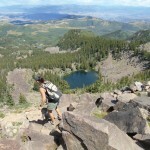 I found my way up through the trees and boulders to the top of peak 11,385. Given the time of year, there was still some old compacted snow on the ridge top. Once I attained the sub peak, it was an easy traverse over to the base of Ibapah Peak. At the base of Ibapah Peak, while considering my best ascent options, I noticed something unexpected — a trail with switchbacks that led to the summit. I climbed the trail and made another discovery at the top. On the 12,087 foot-high summit of Ibapah Peak, on the edge of God’s creation in the Great Basin, I found two round rock structures. They appeared to be expertly constructed; huge granite blocks meticulously fit together. I was fascinated by these ruins and researched their origin. Eimbeck noted in his journal that the station on Ibapah Peak had the following dimensions and features: The diameter of the outside of the station wall was 16 feet. It was a complete circle with the walls made of stone and brick with an average height of 5 feet. In the center of the station were three small brick piers that were used for mounting the instruments. This area of the interior could be closed and protected from the weather while just outside was an “outside walk” or observation deck from which directions and general observations could be made around the station. The station had a wooden floor and the entire thing was covered with a sibley tent. The door consisted of a flight of three steps and it faced the Deseret Peak Azimuth. It appears from the diagram of the station that there were at least six large logs or boards arranged in a “wagon-wheel or star pattern” underlying the entire station to stabilize the structure. Standing next to the rock ruins of Eimbeck’s summit station on Ibapah Peak, I noticed that several old, rotted, wooden planks still remained in the floor. The day was crystal clear and the view north to 12,020-foot Haystack Peak was incredible. The connecting ridge consists of granite spires and rock fields all above the treeline with cliffs and exposure in places. After eating lunch within the rock wall and exploring the summit, we made the arduous trek back down to camp where we arrived completely exhausted, sun burned and generally tuckered out. Ever since I summited Ibapah Peak, I have thought back to the endeavors of Eimbeck’s party in the late 1800s. Eimbeck and his men built trails to dozens of high western mountain summits upon which they constructed stations just like the one described on Ibapah Peak. Several of these peaks were occupied at the same time so that Heliographs — essentially, large mirrors on tripods, could be utilized to send data and messages and measure distance between peaks for mapping purposes. I had heard about “Operation On-Target” where Boy Scouts climb mountain peaks and signal to each other using mirrors and I wondered if Eimbeck’s party was somehow the inspiration for that annual event. Suffice it to say, my time in the Deep Creek Range was well spent as it has provided me with priceless memories that I contemplate from time to time. 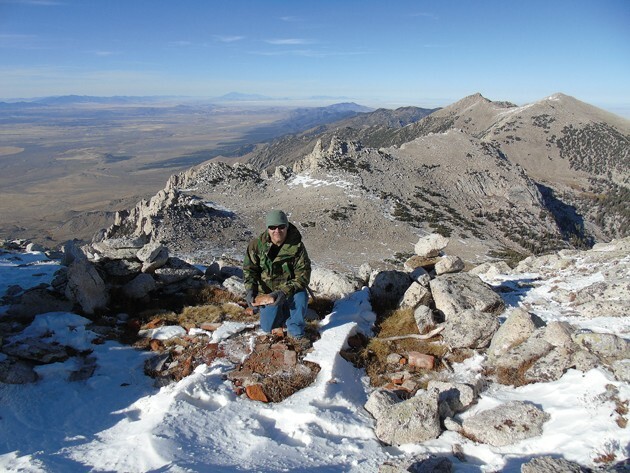 As stated in a previous article, Ibapah Peak is a pristine extreme wilderness, the crown jewel of the Pony Express Trail in our West Desert. Those who have the ability should definitely plan a trip out to the Deep Creeks and climb this peak and walk in the footsteps of those incredibly tough engineers, scientists and teamsters of the USCGS, who occupied Ibapah Peak’s summit for a month in 1889 while mapping our country. If you head out to Ibapah, understand that this is a multi-day and difficult event. From the end of vehicle travel in Granite Canyon to the top of the peak is approximately 5.5 miles one way with an elevation gain of 5,287 feet. I highly recommend that you make the 3-hour drive from the Tooele/Salt Lake area on the first day. 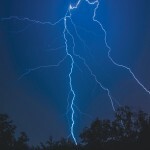 Be prepared for the drive with a spare tire, tools, extra fuel and a first aid kit. Make sure you bring plenty of food and water because there are no services for 80-plus miles as you approach this mountain range along the Pony Express Trail. When you reach the Deep Creeks, establish a base camp along Granite Creek and then get an early start the next day for your attempt at Ibapah Peak. A water filter would also be a good idea so you can take advantage of Granite Creek and other springs for water refill. The mountains will be snow covered above 10,000 feet well into late June so the best time to climb this mountain is July-October in most years. This year might be an exception because early snow has already blanketed these peaks a few times. A camp under the stars in the aspen and fir along Granite Creek, and then a climb up to Ibapah Peak, is the epitome of Outdoor Adventure. Throw off the chains of civilization and go challenge yourself. If you do, the grandeur and extreme solitude of the Deep Creek Mountain Wilderness will be your everlasting reward.